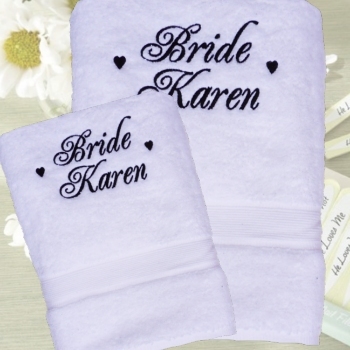 Personalised cotton Bath and Hand towel gift set. Personalised cotton Bath and Hand towel gift set. White bath towel and hand towel embroidered for the Bride OR the Groom and decorated with little love hearts. Bath towel measures 75 x 125cm and Hand towel measures 49 x 90cm each and are 500gsm. Personalised cotton Bath and Hand towel gift set. White bath towel and hand towel embroidered for the Bride OR the Groom and decorated with little love hearts. Bath towel measures 75 x 125cm and Hand towel measures 49 x 90cm each and are 500gsm. One white bath towel and one white hand towel. If you want to request another colour combination please email us. Embroidered with a personalised name or initials in a letter font style of your choice. Please fill in the exact wording you would like custom embroidered (example; Bride Olivia or perhaps just Bride & Groom).